Usually, it doesn’t happen this way, that you buy a project management software just because you came across a nice product website or someone in your network has referred it. Before customers hit a buy button of a project management software product, there are plenty of activities performed by senior manager (along with his/her colleagues). Business managers/owners should clearly evaluate following aspects right at the beginning of PM tool selection exercise. What is the current maturity of project management in the company (planning process, quality/scope/change/risk management, project delivery process, certified PMs, etc.)? Where does your organisation want to reach (maturity goals, transformation objectives, etc)? What Should You Look in a Project Management Tool? 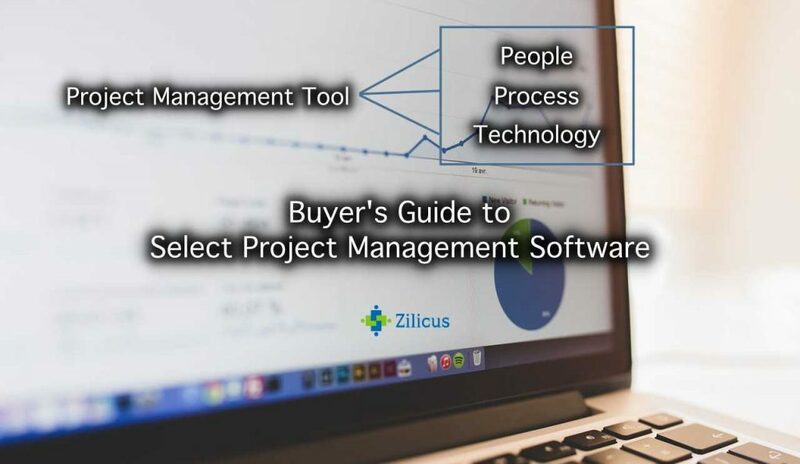 Refer select the best project management software, buyer’s guide for detailed process to select PM tool. Task Management Tool vs PM Tool? List of Project Management Tools? How to Get Executive Buy-In for PM Tool? It was during medieval time when most things were memorised or written on paper. We are living in 21st century. We have technology to simplify our life. When our teams are working on multiple projects at the same time, it is unrealistic to expect them to memorise things from meetings or keep referring Excel or Notes or even emails for their pending activities or upcoming assignments. We all know, email is probably one of the best discoveries of our time but it is also killing employee productivity. In order to deliver projects, there needs to be a central place as a single source of truth to plan project, share document, track project activities and more. Project management tool is a software product that is designed and created to help project manager, project team members as well as clients of the project to work together, collaborate in order to achieve the objectives/goals of the project. The goals and objective of the project typically is to deliver project outcome to meets stakeholders’ expectation. Stakeholders can be project sponsors, end users, clients, partners or vendors. Projects are expected to be delivered on time, within budget, of desired quality. Project management software helps project managers and project sponsors to be more realistic to achieve project goals by working together in project planning, during project execution as well as project delivery using project dashboard, reports, Gantt chart, collaboration features. It helps project team members to remain focused on delivering project work than spending time in status calls/meetings or such avoidable/unnecessary things. Project Management Software is IT application that enables project delivery and make the process of managing projects more efficient. Using project management software, project teams can set sensible timeline and milestones, automate schedule dependencies & communication, giving project manager better visibility to project progress and enable him/her to take corrective actions based on early warning indicators or project management KPIs. Task Management Tool = PM Tool? It is a popular misconception that task management tool is project management software. This is largely incorrect. Task management tools are basic or essential functionality to manage project schedule but project management is much more than task schedule. It primarily involves budgeting, cost estimation, time tracking, expense management, cost management, resource planning and assignment, risk planning and management, incident tracking, project scope and change management, document management, team collaboration and so on. Do read Task Management Tool Vs Project Management Software. Can PPM Software Replace PM Tool? Project portfolio management software (PPM Tools) also falls in a different league from a typical project management tool. PPM tools can offers capabilities of a project management software but most importantly, PPM software allows businesses manage portfolio of projects from strategic and tactical perspectives i.e. managing portfolio of projects, rebalancing risks, analysing cost-benefits across projects, selection of projects, and dashboard/reports to decide on project selection or project kick-off, cancellation, etc. Why Should You Use Project Management Software? Compared to past few decades, the process of managing projects has become more demanding as well as complex. There are quite a few reasons – the business environment itself has become highly challenging, companies are looking to invest in only those projects with greater RoI, greater value to business. Many Businesses have to follow and comply with regulatory and statutory requirements and audit is becoming a regular exercise. Because we have to learn from the history and recent history suggests projects undertaken in Information Technology industry highlights worrying statistics – large sized projects getting delayed, cancelled, run over-budget, offering sub-par or negative return on investments. This trend has also been observed in other industries. These factors have changed the expectations of management, project sponsors and clients. Now there is a constant pressure to deliver on time, and the delivery has to meet stakeholders’ expectations. Project management professionals are trusting project management software to help them plan, monitor and manage multiple initiatives, projects more effectively. PMs are using project management tools to break down large complex projects into smaller sub-projects, setting inter-dependency among projects. Project management tool allows managers easily identify potential risks of failing projects, specific reasons behind degraded performance of projects and enables them to mitigate these risks through mitigation plans, contingency planning and strive for project success. What Does Project Management Research Tell us? 44 percent of project managers do not use project management software; interestingly though top consulting firm PWC has found out that using PM software increases performance . High-performing organisations successfully complete 89% of their projects, while low performers complete only 36% . 77% of companies use project management software, and 87% of high-performing companies use project management software . You will find categories, types of project management software in the section below. Broadly, at one end there PM Tools offering basic features like task list coupled with team-client collaboration; on the other end, there are PM tools offering complete project management capabilities to manage projects right from ideation to planning to execution to monitoring to delivery to closure. Described below, are the common project management features project manager and team needs to manage projects effectively. Project management systems allows project sponsors & managers define the scope of the project, assign project manager, set task schedule, milestones. The best project management software goes beyond task schedule and allow project manager to see projects plan with a bigger picture. It includes budgeting, cost/billing estimation, resources planning, risk planning, scope planning, etc. Often, one can use project management templates to speedup the planning process. Even the well thought project plans will slip through the cracks, it may suffer with changes, issues, risks during its lifecycle. The best project management software provides all the bells and whistles to give you early warning indicators, track project health with finer details of areas where project is lagging so that you can keep the project on track. Once projects are kicked-off, the major hurdle project manager faces is connecting team members, clients, vendors and partners together appropriately. Project collaboration features in the best project management software enables team members work together on tasks, issues, risks, meetings, changes, discussions in various ways such as comments, document sharing, messages, etc. Best PM tool speeds up the project delivery process through better collaboration among project stakeholders. 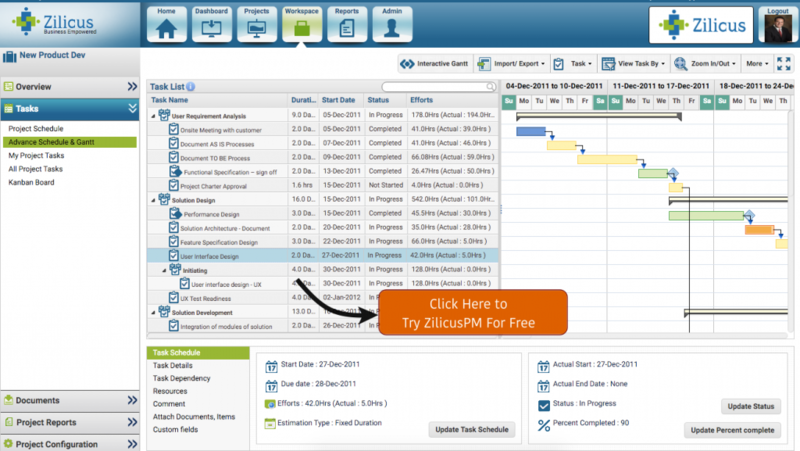 Basic project management tool may offer simple task listing and calendar function. However the best project management software provides robust Gantt chart tool to manage tasks timeline, milestone, dependencies, resources assignment and more. The ability to visualise project timeline using Gantt chart or see project activities visually on Kanban board make it easier for project stakeholders to gauge project progress. Knowing when things are falling through cracks, one can fix the problem with timeline, resources or cost. Project management software helps project manager with that too. Many businesses require their projects to be budgeted using elaborate budgeting process. It involves breaking down project phases, estimating costs, requesting project budget/approval, tracking finer elements of project costs, billing, earned value management, etc. Even simple client projects may need time to be tracked and billing to be monitored. For large project the process of tracking cost and billing is also advance in terms of the depth of data collected and trends analysed for profit/margin, earned value management or better realisation of funds/budget. Resource allocation allows managers to plan for and assign all appropriately skilled resources a given project will require. Project management software treats project resources differently, they can staff member and/or non-personnel. The best PM Tool offers features to identify, allocate, assign/re-assign appropriate resources right through planning process to execution to closure. It provides clear visibility to resource assignments, availability, over-assignment, etc. Real project management tool offers robust capability to identify potential risks associated with projects and/or its activities and highlights risks to project manager. The best project management software allows project manager to review risks and prepare response strategy/implementation plan. Responsible project managers are particular about regularly reviewing risks and working with stakeholders, communicating to manage risks in transparent manner. Many simplistic project management tool include time tracking feature. So it is a kind of minimum for a PM tool. What separates the best project management software from the rest is the ability to view project financials right from the start to delivery to closure. Using these tools, company can select projects based on reasonable budgeting requests, backed by realistic project cost estimation. Next, the ability to track project cost as projects is being executed and keep a tab on billing, margins of the projects so that it delivers desired RoI. Many businesses use project management tool to submit invoices based on tracked time, expenses, input project data to financial and accounting systems. The one of the biggest factor that can derail project is scope creep. There are very few project management systems which allow project managers define and publish the project scope with stakeholders. The best project management software gives you the ability to tackle scope creep through change management process. With change management feature, PM tool allows you to assess usefulness, value and impact of change request before approving/rejecting it. With change management feature, project teams are well positioned to drive project outcome keeping a measured control over scope creep. There is no project that gets delivered without a single issue. Every project some or other encounter with incident/issues. The right way to go about incidents is acknowledging it and setting a process to identifying cause-effect analysis and way to resolve (or keeping in unresolved, depending on its type). The best PM tool not only allows you to manage issues online but also enable you to link the issue with project schedule so that you can trace the impact, a given issue has created on project schedule, resources, cost and quality. There are various types of tools depending on what you are looking for whether it is about features or project management methodology or based on industry or usage/pricing model. Let’s look at some of these types of project management software. Read about Agile Vs Traditional Project Management Approach. Here is the list of 41 project management software to choose from.